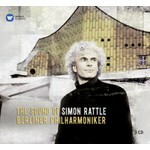 The Musical intoxication of a great era: on 7 September, 2002, Sir Simon Rattle was appointed new Principal Conductor of the Berlin Philharmonic, marking the start of a new and memorable era for the world of music. Rattle has opened up new repertoire channels for the musicians, endowed the tradition-steeped ensemble with a youthful image and established the inimitable 'Rattle Sound'. Great moments - brought together here for the first time on 3 CDs.